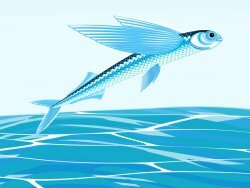 Flying fish, which are common to most tropical seas, are found in the warm waters surrounding Barbados. The species found in this region are about 25cm long and are shaped like a herring. The remarkable feature of this fish is its ability to "fly"! Actually, the fish don't "fly" ... they glide through the air up to distances of 30-40 metres. Just before takeoff, the fish swims quickly towards the surface, bursting into the air at speeds of 55 kmph! Once it is airborne, the fish spreads its large pectoral fins and appears to be "flying". This ability helps the fish to escape from predators. Barbados is sometimes called the "land of the flying fish" and this fish is part of our national dish - "cou cou and flying fish" - where it is usually served steamed. Flying fish cutters are another popular dish in Barbados. You can purchase flying fish at local fish markets around the island. The flying fish is also depicted on our one dollar coin.